Environmental applications of non-thermal atmospheric pressure plasmas for flue gas cleaning from various pollutants have received great attention during the last two decades. We applied glow discharge (GD) and transient spark (TS) for the abatement of volatile organic compounds (VOCs). Fig. 1. Schematic of the experimental system with alternative use of glass and Cu tube reactors. Both GD and TS discharges applied to the VOC removal in various reactors (Fig. 1) were comparable from the point of view of the chemical efficiency of VOC removal (namely cyclohexanone and toluene). Discharge polarity did not significantly influence the efficiency. The energy costs were lower in TS than in GD, especially when the process operated at low residence times of the treated gas in the reactor (high gas flows). TS was cheaper from the point of view of energy cost. Working with higher initial VOC concentrations was always more convenient; the energy costs were lower in all cases. 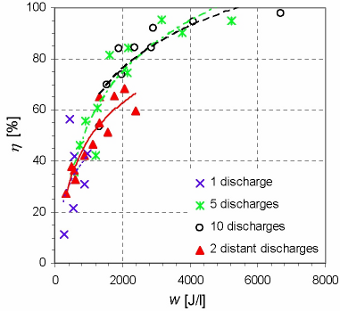 In both discharges and both polarities we obtained 50–95% of a decomposition rate at low energy costs of 16–600 eV/molecule and various energy densities (50–2000 J/l) (Fig. 2). The GD and TS plasmas are effective for VOC removal and are able to compete with other non-thermal plasma applications for pollution control. A possible explanation of low energy costs might be a recycling of the energy in the plasma-chemical processes based on the incorporation of activated nitrogen species into CO2 and hydrocarbon residues. Excited species of nitrogen probably work as energy reservoirs. Fig. 2. 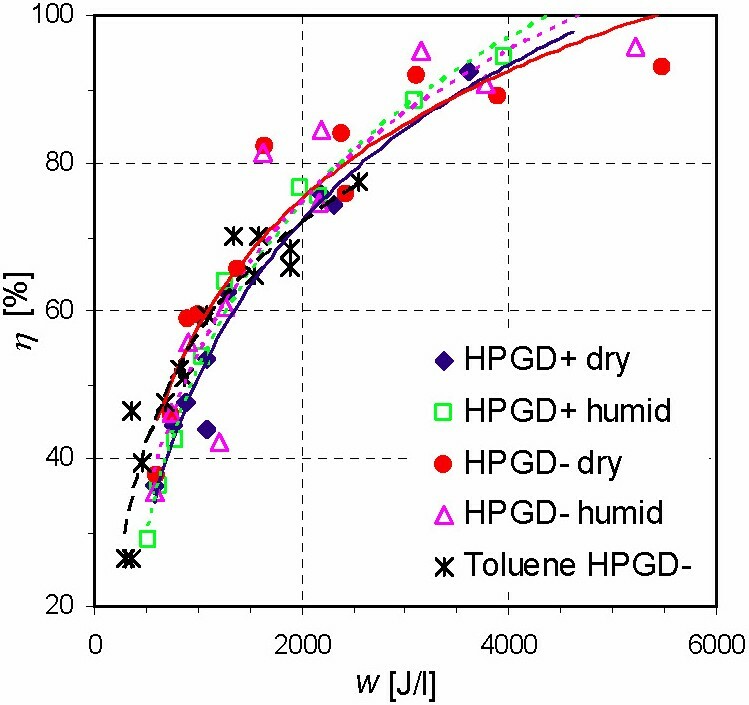 Removal efficiency, η, as a function of the energy density w. Both polarities of GD in dry and humid air, 5-point glass tube reactor, cyclohexanone 2000 ppm. Toluene 2000 ppm in negative GD has been added for comparison. Fig. 3. 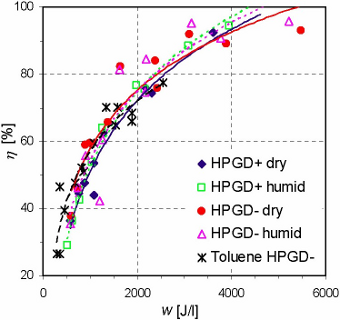 Removal efficiency, η, as a function of the energy density, w. Glass tube reactors with 1, 5, 10, and 2 distant discharges, negative HPGD, humid air, cyclohexanone 2000 ppm. 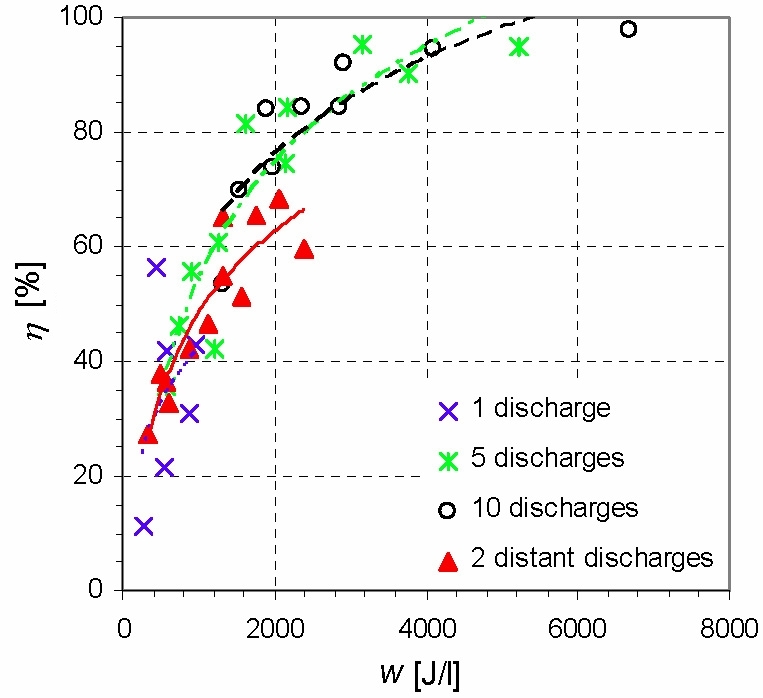 By comparing the effects of 1, 5, 10 and 2 distant discharges, it was found optimal to operate about 5 discharges distant from each other (Fig. 3). This is associated with the fact that the electron-impact and thermal VOC decomposition processes are coupled with radical-induced volume reactions. Putting the consecutive discharges far from each other extends the radical-dominated decomposition phase. The VOCs tested were converted to some gaseous and some condensed products. The products were extensively analyzed by the FT-IR spectroscopy (Fig. 4). When the energy density of the discharge was high (operating at low gas flows and with long residence times in the discharge volume), the process led to the dominant formation of combustion products (CO2, H2O, CO and NO2 characterized by a relatively low CO/CO2 ratio), especially in the more thermal GD. On the other hand, solid products based on amino acids were preferentially formed when the energy density was lower (shorter residence times), especially in TS with copper electrodes. Amino acids and other condensed-phase products (amides, imides) are non-toxic and more convenient from the point of view of the global Earth environment than gaseous combustion products, such as CO2, CO and NOx. GD and TS used for pollution control are neither typical non-thermal plasma applications, nor fully thermal plasma processes, but something in between. The thermal decomposition of the VOC is coupled with the radical induced volume reactions and heterogeneous surface reactions. Fig. 4. 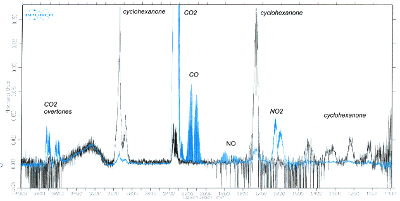 FT-IR spectrum of cyclohexanone (2000 ppm) in humid air before (black) and after (blue) negative GD treatment in the 5-point reactor. Bands of the dominant gaseous products are identified. The VOC removal application of TS was tested in a small pilot-scale reactor in industrial conditions. Cyclohexanone in a mixture with some other VOC was successfully removed with the efficiency of about 50–60% at very low energy density (9–14 J/l). The process was energetically cheap and relatively effective even at high gas flow rates through the reactor. The major product was a nontoxic amorphous condensate based on amino acids. The tests confirmed the practical use of this method and the possibility of its application on larger scales. We studied NO removal by positive DC corona discharge in mixtures containing N2, NO, O2, CO2 and H2O (Fig. 5). Nitrogen oxides (NOx), produced primarily by coal-burning power plants and diesel engines, are considered to be one of the most aggressive chemicals in the exhaust gases. They contribute to air pollution, acid rains, photochemical smog production and the steadily increasing concentration of greenhouse gases in the atmosphere. 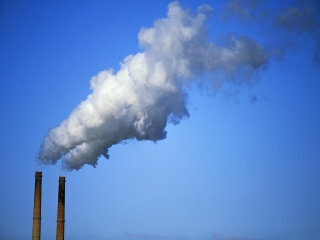 Consequently, they also cause many serious respiratory diseases such as bronchitis and pneumonia. Several methods have been proven efficient in removing NOx from flue gas, including corona discharge. We achieved the removal efficiency of 89% for NO and the energy cost of 350eV/molecule. Special attention was paid to the influence of CO2 on the discharge, its character, performance and products of the process. Despite the fact that CO2 is one of the major components of real exhaust gases, no detailed description of the effect of CO2 on NOx treatment process was published before. Fig. 5. 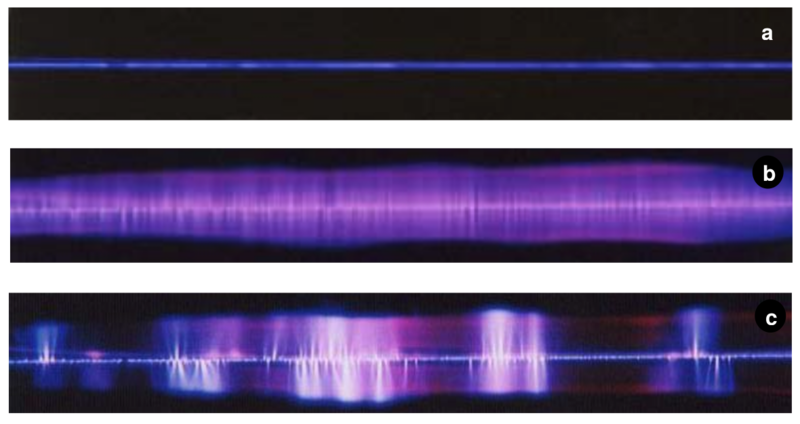 Photographs of typical corona discharge in different gas mixtures (IDC = 1500 μA): (a) N2 + 20% O2, (b) N2 + 250 ppm NO + 20% O2 + 20% CO2, (c) N2 + 250 ppm NO.